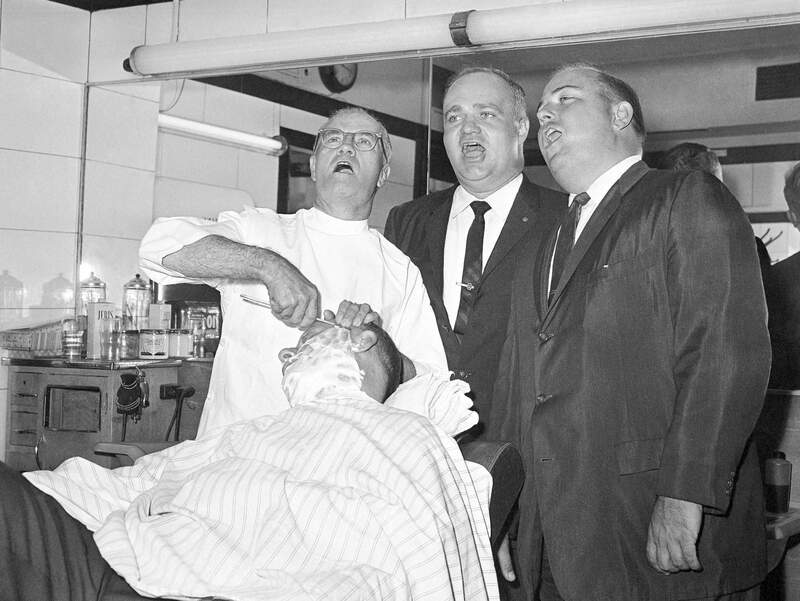 Three members of the Sentiment-Gentlemen Quartet, standing from left, barber Ancel Cochran, florist Jack Goza and insurance salesman George Roth, sing in an Atlanta barber shop while Abner Cohen receives a shave on Sept. 30, 1961. After 80 years of being a male-only organization, the Barbershop Harmony Society announced Wednesday that women will be allowed to join the a Capella singing organization. NASHVILLE, Tenn. – After 80 years of being a male-only organization, the Barbershop Harmony Society has announced that women will be allowed to join the a capella singing organization. The singing style has evolved over the years, gaining more recognition recently because of the “Pitch Perfect” films and the new-found popularity of school glee clubs, which have adapted current music to the singing style. They have conventions and international competitions with singers from all over the world.